That’s not to suggest Kyle Sloter is a dark-horse candidate to be the team’s starting quarterback in 2018, but the Vikings have made it clear they like the undrafted former Northern Colorado quarterback. When considering the Vikings’ quarterback situation heading into 2018, much of the conversation — and rightfully so — is focused around Case Keenum, Teddy Bridgewater and Sam Bradford. All three have laid claim to the Vikings starting job at various points in the last three years, and all three are free agents. But it’s also not quite accurate to say every Vikings 2017 quarterback is a free agent, nor is it quite right to ignore one other passer who could be a factor: Kyle Sloter. That’s not to suggest Sloter is a dark horse candidate to be the team’s starting quarterback in 2018, but the Vikings have made it clear they like the undrafted former Northern Colorado quarterback. First, they paid him nearly triple the going rate to sign him to their practice squad in 2017 after the Broncos cut him at the end of the preseason. He sparkled in four preseason games for Denver, throwing for 413 yards, three touchdowns and no interceptions with a 125.4 passer rating. 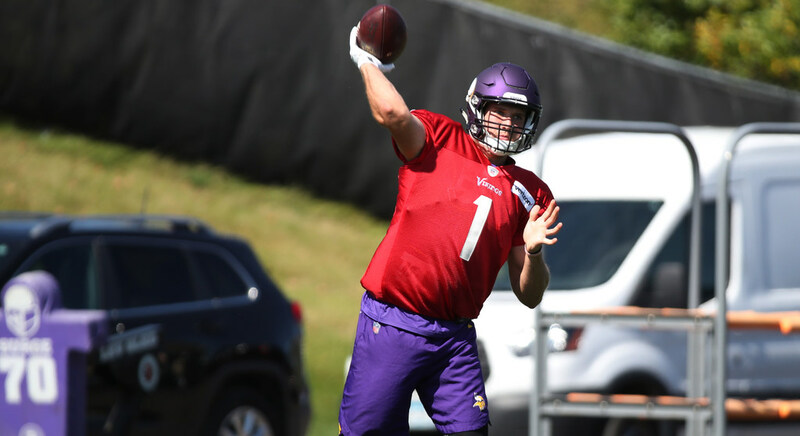 The Vikings promoted Sloter to the active roster early in 2017 after Bradford was injured and maneuvered to keep him on the 53-man roster even as Bridgewater and eventually Bradford returned to health. He’s the only Vikings QB under contract for next season. Sloter never threw a pass for the Vikings as a rookie in 2017, but he served as the No. 2 quarterback behind Keenum for a stretch – perhaps a sign of the Vikings’ comfort level with him. He was undrafted, sure, but so was Keenum. At 6-4, 218 pounds, Sloter has prototypical size for a quarterback. The Vikings also like Keenum, Bradford and Bridgewater for various reasons. Sloter is a fan of all three, too.